Not exactly the same as the Walmart chocolate covered nuggets of joy, but they did the trick. 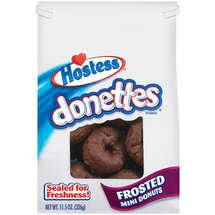 I stopped at three (donettes, not bags)...but it took every fiber in my being not to eat the whole bag. I might have to throw them away tomorrow if I can't control myself. I know it's wasteful, but eating a bag of Hostess Frosted mini donettes is not good for my girlish figure. It's definitely a must to keep our girlish figures. Hahaha!! Off topic question for you. When Avery got her shots did they give her the combination vaccines? Sophia is obviously going through her round of shots and I don't think I'm comfortable with the combination shots... there are some alkaloids that don't do any good when combined. I was just curious what your opinion is. Glad to hear you got your fix! When I was preggo with Everett I swear I ate nothing but milk duds, m & ms, and chocolate chip cookies. I swear, I am amazed he didn't come out looking like a piece of chocolate. I say you aren't pregnant that often, indulge-of course I say that as a woman who gained 75 lbs. in her pregnancy and took a year to get back to pp weight...but I still say do it!